Oh, That Vicious Pit Bull! Between Lennox in Belfast and Dre in Colorado, it seems like sad stories about pit bulls are everywhere. Both, make me so sad that it’s hard to follow them closely, because it just so incredibly upsetting. It also brings to light the extreme biased that exists toward the breed. 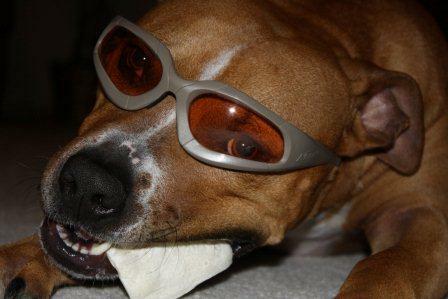 Many people immediately believe every pit bull is predetermined to be nasty, vicious and mean. Well, that’s not always the case, and reminded me of an assignment I was sent out on when I was a street reporter at a New York City newspaper. We listened to the police scanners the way most people listen to their iPods. One summer afternoon a call came over the scanner about two vicious pit bulls attacking a small child. The pit bulls were surrounding her and neighbors were freaking out. It was in one of the not-so-great areas of town, too. When I got there, I found a single police car and no one around. I did some investigating and finally found out which apartment the family lived in. I knocked on their door not knowing what to expect. Would I be greeted by drug dealer? A jumping-in-my-face pit bull who would easily snap at me? I was welcomed in by an older lady, who ended up being the little girl’s grandmother, and of two large pit bulls who were laying down on the floor near the couch. Not only did they not get up when I walked in the door, but they didn’t even bark at me. After a few minutes talking with the woman, I learned that while she was in the other room, her granddaughter figured out how to open the door and took a stroll down the hall, onto the elevator and out the apartment complex’s front door — all with the two pit bulls never leaving each side of her. Because the neighborhood was not the in the best of areas, the family had trained the dogs to protect the little girl. Where she went, they went. Unfortunately, that story never made it into the newspaper. As soon as my editor heard there was no attack, it was nixed — despite my persistent argument that it was a great human interest story. We can all do a little part to help debunk the myth that all pit bulls are vicious. And, it can start with showing support for Dre. Even a small donation to the ChipIn account created to pay his legal fees will make a big impact. Next Post Video Contest: How Is Your Dog Great? It really is sad that the media covers only the lurid stories and so few human interest stories. I think it would be a better world if we could hear more about how kind people are and how gentle Pit Bulls are. Pitt bulls don't deserve the bad reputation most people hold of them. Just like people, if they are raised to be bad and fight, thats what they will do. The saying "look at the other end of the lesh" needs to be looked at more closely. What a lovely story, about the little girl and her protectors! It's such a shame that it got nixed…..you'd think that newspapers would be more interested in publishing the TRUTH, as opposed to sensationalist things, and things that require "spin". Just goes to show , good news is no news……..how sad. Have a wonderful Wednesday. That's horrible that they wouldn't even consider running that story in the paper. As much as I love reading and try to stay up on events, I hate the dramafest that so many magazines and newspapers (ok, some blogs too) get caught up in. Ugh.